GovTrack.us gives it a 3 percent chance of being enacted. The Washington Council on International Trade has estimated that a port slowdown from late 2014 to spring 2015 came at a cost of $770 million to businesses in the state. An eye-opening number, to be sure -- and yet it merely scratches the surface of the deep-seated economic damage caused by the slowdown. So, before we delve into the true costs of the action by longshoremen, we renew calls for Congress to consider a bill introduced last year by Rep. Dan Newhouse, R-Yakima. In presenting the Ensuring Continued Operations and No Other Major Incidents, Closures or Slowdowns bill -- ECONOMICS -- Newhouse said, "We must take the lesson of the most recent ports slowdown to heart that two parties cannot hold hostage the nation's economy." That is what happened from October 2014 to March 2015, when workers at 29 West Coast ports (including Seattle and Tacoma) engaged in a work slowdown as a form of labor protest. The result was exports waiting to be loaded for overseas shipment and imports languishing for weeks or months before being off-loaded. 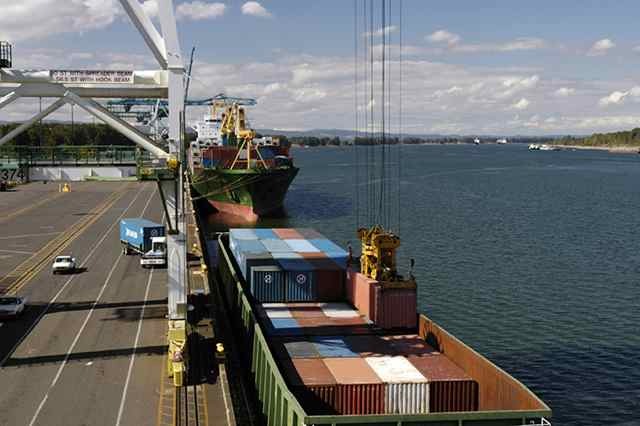 The Washington Council on International Trade last week released a report claiming that the slowdown led to $556 million worth of goods from the state not being shipped by waterborne containers, along with increased costs for alternative transportation and rotted agricultural inventory. But, as if part of a seminar in Economics 101, the damage from the slowdown was much more extensive and long-lasting. For Clark County, the impact is felt every day. During the slowdown, the two largest container shipping companies operating at the Port of Portland ceased operations there. That has led to an increase in heavy trucking services throughout the area and has compounded the traffic nightmare that is the Interstate 5 corridor. In other words, the slowdown at the Port of Portland (the Port of Vancouver reported no slowdowns during the dispute) remains costly for local commuters in terms of gas expenditures and wasted time. And for Washington businesses, the slowdown led to frayed economic relationships with overseas markets. As the council notes: "While these impacts are not quantified in this report, they are real and potentially much greater than the near-term costs presented above." In short, all possible steps must be taken to prevent such a slowdown in the future. The Obama administration was reluctant to get involved in the dispute, despite several requests from port operators. Obama should have adopted the tactic of President George W. Bush who, during a port labor dispute in 2002, invoked powers enumerated under the Taft-Hartley Act to impose a cooling-off period and forbid work slowdowns. The Newhouse bill, co-sponsored by Washington Republican Reps. Cathy McMorris Rodgers and Dave Reichert, would require a board of inquiry to be convened when four or more ports are involved, when 6,000 or more port workers are impacted, or when U.S. exports or imports drop 20 percent in a single month. Thus far, the bill has been referred to committee, and GovTrack.us gives it a 3 percent chance of being enacted. Whether or not the Newhouse bill is a reasonable solution remains to be seen. But the federal government should not turn a blind eye to the vast impact a port slowdown can have on the economy. The Washington Council on International Trade estimates the immediate impact of the last slowdown at more than $700 million, but the total damage has been far greater.